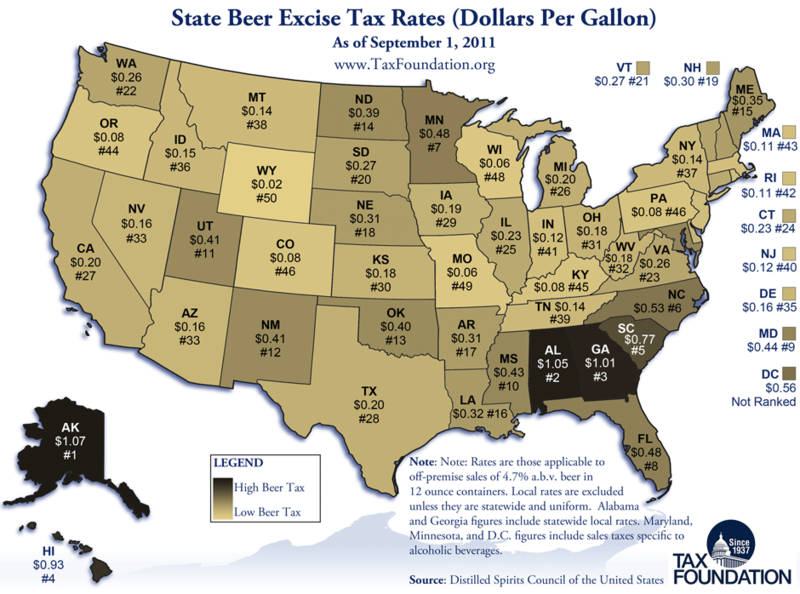 Trying to understand state excise taxes on beer. I was wondering what you guys thought might make these tax rates vary by state? Let me tell you that I punched these numbers into SPSS (stats software), used OLS regression, and found that %Christian, %liberal, perCapita car fatalities, property tax rate, and #breweries per state all had no effect. It was all state level data. I am leaving out of this explanation the one and only variable that had a coeeficient that was significant (it is positive and a can of worms). I am thinking of writing this up, but am interested in including more "controls" or explanations that help us understand state excise tax policy. What do you think the model is missing? I should probably include medianIncome and maybe percapita # of breweries in the state. Re: Trying to understand state excise taxes on beer. I don't think there's much mystery. States with breweries big enough to do substantial lobbying (CO, TX, MO, WI, PA) have low taxes. Big breweries might matter but #of breweries doesn't. Maybe I should get a figure for the number of brewery employees for each state. The more people are employed by breweries then the lower the taxes on beer, right? ^ Nailed it. Except Wyoming, they just don't really have taxes there. Or people from what I remember. Population density is the next to lowest in the country, next to Alaska. Western Wyoming is beautiful. Alright. So if you exempt those 5 states, what explains the rest? ABInbev also have breweries in CA, GA, VA, NY, NH, FL, VA.
MillerCoors also in CA, GA, NC, VA.
Not all are low tax states. Just saying. Well, I'm not going to run the regressions, but it sounds like you have, so you tell us. Maybe legislators in some states are just lazy? Fair point, but if you except the South, where they're just into that kind of thing, it still applies. I missed NJ. You are probably right. Big business often has many reasons to locate a facility, taxes are just one. I am wondering what the can of worms correlation is. GA and AL have a "uniform statewide local excise tax." I have no idea what that means, but the state excise tax for GA is actually $0.48 and AL is $0.53. And Wyoming passed their tax back in 1935. The rate in that graphic for WA is actually the old "high tax" rate. The new 2010 WA "high tax" rate for beer is $0.76, and the "low tax" rate for small and domestic breweries stayed the same at $0.15. I haven't checked the other numbers in the graphic, but at least that one is wrong. I was just running the numbers yesterday and according to my analysis the only variable that had a significant coefficient was %populationBlack. According to the regression model, as %Black increases so does tax on beer (about .40 cents for every percentage point). I told you it was a can of worms. This finding is, however, consistent with some of the prohibition literature I have read (check out Okrent's Last Call). This also seems analogous with some of the the political science (my day job) research in other policy areas. I suppose if I include other variables like median income the relationship between race and beer tax might disappear. what's the r^2 for that correlation? The model explained about 17% (r-square) of the variation. It is a small r-square. So 0.17? That's an incredibly small coefficient of determination.